Ricardo Mantilla, assistant professor of civil and environmental engineering, observes a hydrodynamics experiment during the Engineering Annex Media Tour, which was held Feb. 19, 2018. Photo by Justin Torner. 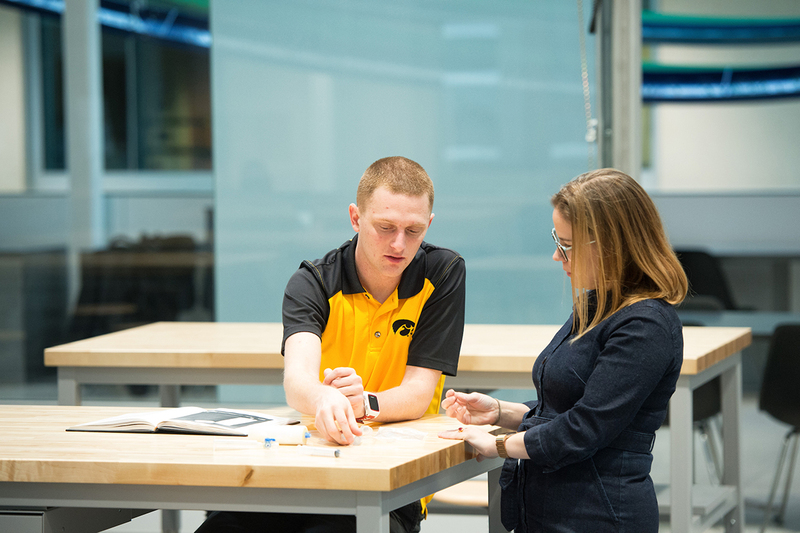 The Annex, a new extension of the University of Iowa’s Seamans Center for the Engineering Arts and Sciences, will lead students into the next century and beyond with expanded educational opportunities and state-of-the-art classroom, research, and study space. Constructed over a period of 20 months, the $35 million Annex reflects the college’s educational goals, including an increased focus on hands-on design training and skills building, as well as instruction and mentoring that brings to life engineering concepts for a new generation of students. The contemporary structure, located near the UI’s historic Pentacrest, offers an additional 65,000 square feet of space for the college. The Annex also relieves some of the physical constraints that have accompanied a prolonged surge in student enrollment. The original College of Engineering building was constructed in 1905 and expanded twice, in 1964 and 2001. Since the most recent expansion, undergraduate enrollment has doubled, reaching 2,200 students. Scranton calls the design studio, a 5,000-square-foot classroom, the “jewel” of the new addition. The nickname is a reference to the studio’s dazzling floor-to-ceiling glass walls and large, retractable glass doors. In the studio, students will work with professors on multidisciplinary projects that will stretch the imagination and encourage bold research endeavors. During construction of the Annex—the cost of which will be covered in part by alumni donations—there was a sense of suspense because plywood walls and plastic sheeting blocked access and views. When those barriers came down in January, students were eager to explore.